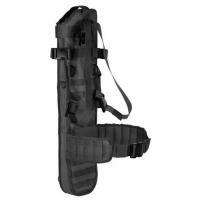 The Voodoo Tactical Assault Rifle Scabbard is a convenient way to carry your rifle in safety and comfort. It fits the AR-15 and similarly-sized weapons, with or without a scope. The rugged pack cloth exterior is highly wear-resistant, and features heavy padding throughout for maximum protection, particularly at the vulnerable nose. An adjustable, removable shoulder strap and a padded waist belt make it easy and comfortable to carry, and both the belt and the scabbard feature extensive MOLLE webbing for attaching magazine pouches and other accessories. A set of six D-rings also allows you to attach the scabbard to vehicle mounting points.